So you’re engaged. Great! I’m so happy for you. Your special day will be amazing, but you have to take the steps now to ensure a drama-free affair. Below, please find my checklist to an easy-peasy big day. Please note, certain event venues will include everything you need, some are a la carte and some are simply a physical space. Of course, it’s easiest to choose a beautiful venue that will do everything you need, but if you have your heart set on your dream location, it’s worth it to put the leg work in and round up the vendors yourself. Set a date. I know it seems quick, but drink that champagne, have a no-pants party to celebrate, then set a date. You’re going to need it for when you call everyone and they want to know WHEN IT’S HAPPENING. I recommend a date that’s 9-12 months away from your engagement date. You’re going to need time to plan. Start a dream wedding binder: Communication is key in this step. Talk to your partner about your dream wedding day, listen to hers and smush them together. Have you always wanted an outdoor wedding and she has always wanted to get married in a church? This is a good time to find out. Remember to compromise. It’s her big day, too. Your wedding is the start of your life together, once the day actually comes it will be OK if you compromised on the napkin color when she’s reading her vows to love you forever. Get a stack of wedding magazines and tear out what you want. Or, do the digital thing and start a few wedding boards on Pinterest. Budget: Talking about money is never fun (unless you have a ton of it), but talk about budget. What can you spend that won’t send you into a horrible debt spiral? Are anyone’s parents ready and willing to help out? Part of the reason I recommend taking a year to plan the wedding is because it will also give you time to put together a savings plan for the big day. Guest List: I know, it’s so early, but you’ll be surprised how easy it is to bang out a tentative guest list. This part can be super stressful if you have a smaller wedding and have large extended families. Remember, a good number of people will say no. Weddings are expensive to throw and expensive to attend. So about 30 percent of the people you invite will decline. Some couples choose to have an A-list and B-list. You invite the Bs when space opens up from A declines. Like, if your future in-laws need to invite their BFFs to see their little girl get married, put the BFFs on your B list. I know it doesn’t seem nice, but it can actually help alleviate your stress. And it’s YOUR wedding! So do whatever makes it easier for you and your partner. Put all your guests into an Excel spreadsheet along with their addresses. If you don’t know everyone’s address, start asking. This will come in handy when you are sending out invitations later. Pick a place: Start looking at venues. I know this seems far in advance, but big weddings are IN and the most popular venues will be booked this far in advance, if not further. Interview vendors: Be sure to find out what services the venue comes with and what you will need to bring in. For example, if you choose a hotel, they will probably be able to provide most of the services you are going to need. You might only need a flower vendor. However, if you are getting married in an outdoor space, you need to consider questions like do I need to rent port-a-potties? I know. It sounds insane, but not all venues come with bathrooms. Make a list of the vendors you need. Pick a person: Decide on who you want to actually marry you. You want to do this early to ensure the person’s availability. Pick a wedding party: This one is tough if you have extended family or a ton of close friends you don’t want to feel left out. If you have a sibling, the best thing to do is to make them your maid of honor or best man. No one can complain about being a bridesmaid instead of a MOH, if they are bumped for family. If you have two sisters, have two MOHs and ditto for brothers. The goal is for you to be supported by your closest friends with as little drama as possible. Stationery: In this day and age, most of us only read about stationery in Jane Austen novels. But having a great stationery vendor is crucial if you want to make sure your save the dates match your invitations and your thank -you notes. Get an outfit: You want to start this process early so that you find the right thing and have time to have a few fittings. Two or three should be more than enough. Also, make sure your bridal party is getting it together, too. Get a free wedding website: There are a few really awesome free websites that will give you a space to provide information about your wedding to your guests such as where it will be, which hotels are nearby and where you are registered. Book a hotel-room block: This is courteous for your out-of-town guests. It won’t cost you anything and will make sure no one is sleeping in their car. Register: Go to stores and point that fun, clicky thing at all the things you want to fill your marital home. Don’t worry about registering being presumptuous. You are helping people buy you what you want without thinking about it too hard. Send out save the dates: Include your wedding website URL so early birds can start preparing. Some guests will want to book their hotel rooms or send you an engagement gift as well as a wedding gift, so don’t skip those two steps. Nail down your vendors: You’ve interviewed some vendors in each category and gotten proposals, now it’s time to commit. Sign some contracts and get deposits together. Pick people you are comfortable with, who you trust. If you can’t find any of those, at least choose the ones with a lot of good yelp reviews or who come highly recommended by the venue. Stay in constant communication with them throughout the process. Don’t be a bridezilla, but check in with them and make sure no one is falling behind on anything. Plan a honeymoon: More fun and way less stressful than planning the actual wedding itself. Pick some music: Work with the DJ and / or band to put together a playlist. Be prepared to have to think about what you want to walk down the aisle to, what will be playing when you exit, what you want to walk in to, what you want to cut the cake to, etc. Any good DJ or band will work with you to make sure they can get what you want. Plan a wedding itinerary: Put together a list of the events that need to happen at the wedding and when. For instance, the first dance will happen right after we are introduced, then we will dance with our parents, then the toasts, etc. Distribute this itinerary to all your vendors. Seriously all of them. It can’t hurt. If you have a wedding coordinator who comes with your venue or caterer, ask for help. They are experts and they are happy to help. Seating arrangements: Diagram it out. Make sure grandparents are close to the restrooms and old college buddies are close to the bar. Order wedding favors: Give guests something cute and small to remember your wedding by. Some couples give candles or wine glasses with the wedding date on them. Finalize toasts and readings: Make sure that the people you want to lead the toasts and readings are committed to doing them, so you can write up and print your program. Print stuff: Print invitations, wedding programs, wedding menus, place cards, table numbers. Print it all. Send your invitations: Eight Weeks before the ceremony. I’m so serious about this. Exactly eight weeks so you don’t drive yourself nuts. Assign each of your guests a number (this should be easy, since they are all in a spreadsheet anyway) and write numbers on the back of all the RSVP cards because people are going to forget to write their names down. Make sure your outfit still fits: Planning a wedding is stressful, it can cause people to gain or lose weight. Who knows what will happen. Get thee to your tailor. Make sure your bridal party has things to wear: They have other things going on besides your wedding; don’t get upset if they don’t remember to get their dress fitted. Gently remind them. Get your money, honey: It’s super annoying, but most vendors want cash money when the wedding reception is over. Put together carefully labeled envelopes with certified checks/money orders/cash. Give it to your BM, MOH or someone else who is super responsible and won’t rob you. Introduce them to your vendors, so they can get paid out at the end of the night. Delegate: Assign the wedding party jobs. Have someone put together a box for wedding envelopes who will either give them to you at the end of the night or hold onto it until you get back, ditto for the wedding gifts. Have someone else in charge of getting people to sign the guest book. If you or your partner are wearing a dress that needs to be bustled, have someone practice bustling it. If you need help going to the bathroom in your dress, have someone who will hold it for you. 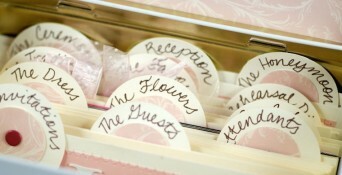 Delegating is the key to keep your big day going smoothly. Bachelor / Bachlorette party: Some die-hards still have this celebration the night before. I don’t think that’s the best way to look fresh as a daisy on your wedding day. Have it the week before and avoid being hung over in all your pictures. Vendor check-in: Go over all the details with all the vendors. Every. Single. One. Hold a rehearsal and dinner: This is usually just for the bridal party and immediate family, but if you have out-of-town guests it’s nice to invite them as well. Get some rest and get ready to party! Posted May 7th, 2014 & filed under Love. Lesbians getting engaged: Who should propose?